The experienced England scrumhalf spent eight years with Sale Sharks before moving to Saracens in 2010. The move bore fruit as his impressive form for Sarries earned him and England recall and a place in the squad for the 2011 World Cup. While having a quick pass and eye for the gap at scrumhalf, Wigglesworth is also more than able to play flyhalf or wing. His strong left boot is also an additional asset if he plays inside a right-footed playmaker. He was named in the English squad for the upcoming 2015 Rugby World Cup. In May 2017, Wigglesworth was named in the England squad to face the Barbarians, having won 27 caps to date. Wigglesworth was called into the England 6 Nations squad as an injury replacement in February 2018 and will look to add to his 27 Test caps having last played a test match for England in 2015. He featured in 4 of England's 5 Six Nations matches and was named in England's June Test Squad. 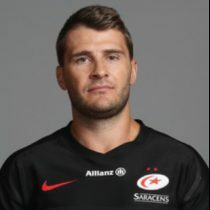 As of the 2018/2019 Champions Cup, Wigglesworth has had 93 European Cups appearances scoring 7 tries and 58 points.